I first saw mangoes eaten whole in Mexico city. Our friends had a lovely set of silver mango forks, with super long central tines which when inserted into the pit, near the stem end, allowed the skin to be peeled down, in several strips. They just bit into the luscious fruit–like a temperate ice cream cone. In Montserrat, I saw massive mango trees, laden with dangling fruit, like multiple holiday ornaments. As wonderful as they are, mangoes, are not integral to this recipe. They just happen to go really well as an accompaniment, especially with the leftover Sesame Ginger Chicken. 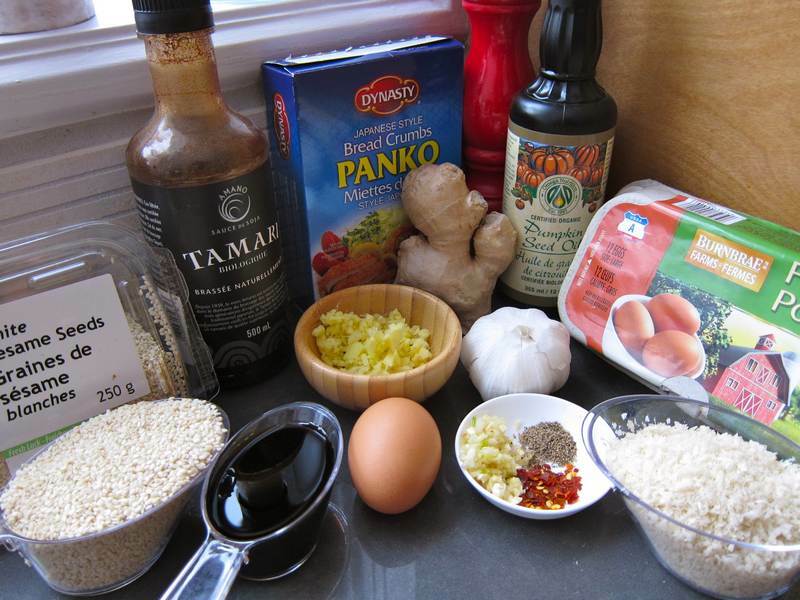 Mix soy sauce, ginger, garlic, pepper and red pepper flakes in a bowl, then combine with chicken in a large baggie. Refrigerate 3 hours to overnight. Preheat oven to 400 degrees. Lightly grease a 9 x 13″ baking dish. 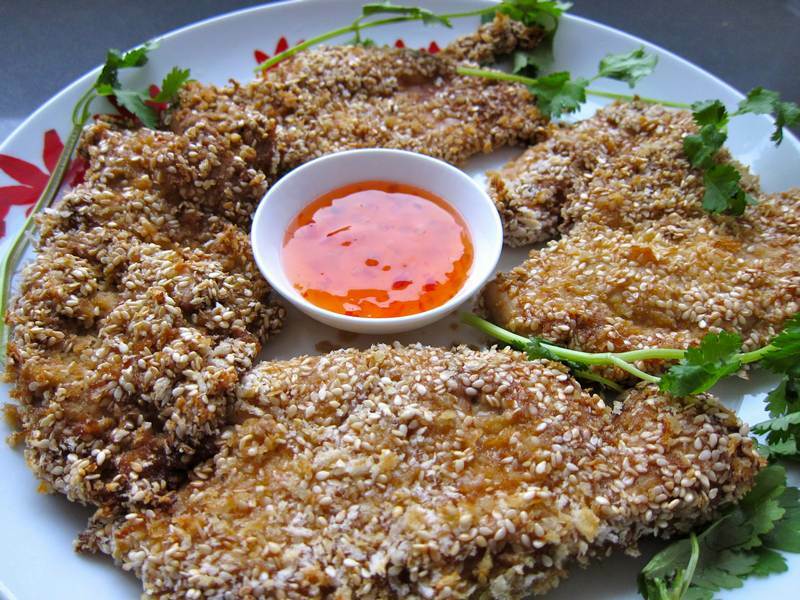 Combine panko and sesame seeds on a large plate. Remove chicken from baggie, then add the beaten egg to the marinade. Dip each chicken piece in the marinade, then in the panko, before placing in the baking dish. Spray or lightly brush with oil, then bake for 45 minutes until brown and crisp. Tastes good with sweet and spicy chili sauce drizzled on. The first night I served it with rice that was cooked with celery, scallion, red pepper, spinach and egg. 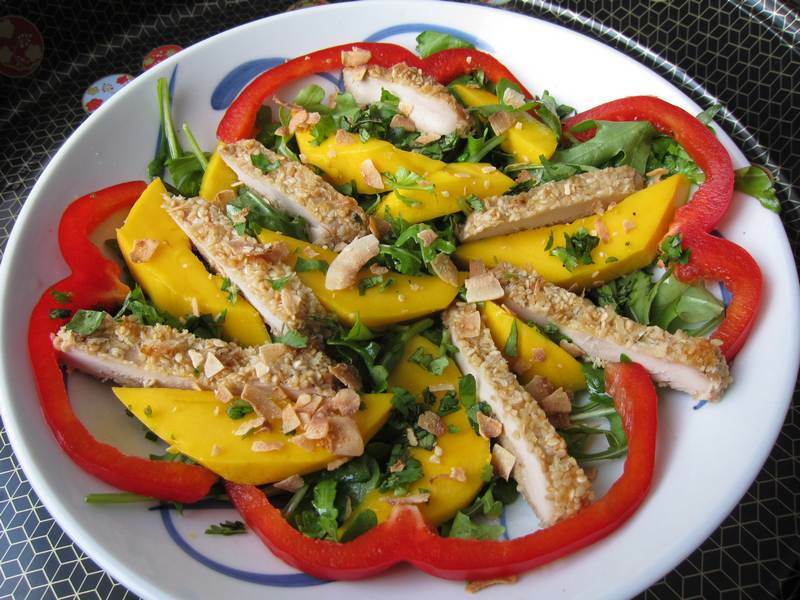 The second day I served the Sesame Ginger Chicken atop a salad of arugula, mango and red pepper, dressed with chia oil, seasoned rice vinegar, sea salt, freshly ground pepper and sprinkled with cilantro and toasted coconut flakes. It was the best salad I’ve eaten in a while. The toasted coconut flakes are not optional–so sweet, salty, tasty good. Check out this portion control post on Eat, Spin, Run, Repeat. It is a wonderful guide to healthy eating and weight loss. Thanks once again to “Cooking With Love” for yet another delicious recipe. Support this excellent Maimonides fundraiser, treating yourself, your loved ones and those in need simultaneously. I’m hoping that my good friend Cheryl Levy will not come to regret allowing me to post as many of their recipes as I’d like. O.k. that’s it.. I am inviting Allan and myself to move into your house and let you do all the cooking. This recipe sounds delicious. I also love mangos. My favourite fruit. Glad you like the recipe! I’m positive I’d love your cooking too. How can you brush the chicken with oil when the chicken is already breaded? Don’t you end up brushing the crumbs off? The real smart way is to use one of those pumps that spray out your own olive oil, like the one that pampered chef makes. I used a silicone pastry brush to scatter on a few droplets and no crumbs were removed. Oh, I see. You are just flicking the oil on via the brush? Do you do this to make it crispier? Yes. Crispier. Just a little is used. Sounds like a variation on the Chicken Mango recipe from the days of Botner. Of course and I remmeber that amazing recipe in those books you published. Oh my gosh Holly this looks incredible. I highly recommend using an olive oil sprayer, you can control the amount of olive oil. Did you use the bar pan to bake them in? For sure. The bar pan was perfect. Wish I had the spray bottle. OK, I give in. Please order me a Pampered Chef oil spray bottle and please send me strict instructions to prevent blocking the nozzle, and I promise to follow them to the letter so that I won’t be disappointed! Liked? No, I loved it. Only problem–There were no leftovers! Wow, you are a fast worker…or did you make this recipe a while back as you corrected several versions for me? I don’t know what I’d do without your grammar and punctuation assistance. It is very scary to be so exposed as someone with something to say, but little control over how it is said. Much appreciated! 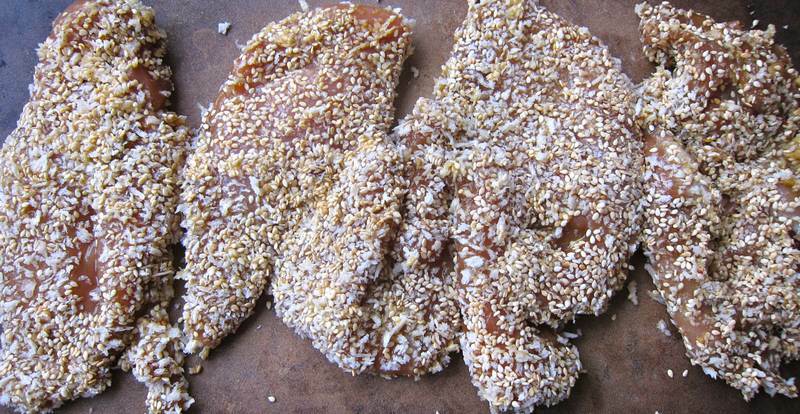 I tried this sesame chicken and it was truly delicious. Following your lead, I made a salad with the leftovers the next day. I used spinach, red peppers, tomatoes and mandarins with a little sesame oil and rice vinegar. I took a photograph of the salad for one of my photography assignments and it was hard to focus on the photos with my mouth watering! Well, I think I'm going to want to see that photo! Thanks for liking. Look what a monster you've helped to create. It was really the voice in your blog that pushed me into this. I wish I could say that my husband thanks you. He barely recognizes me these days!